Our branch is from Banks Gunter, a son of Joshua Gunter (see below). Banks is born in SC about 1795 and lives along the Edisto River in the vicinity of Chinquapin Creek and Lightwood Knot Creek in Lexington Co., SC. He dies before 1860 and much of his family moves to Talladega and Clay Counties in Alabama. Here are surnames allied with the Gunter family. ** NEW ** Banks of the Edisto, available April 2019 from Amazon.com, compiled by Jim Sexton. It’s a family story and compilation of the descendants of Banks and Nancy Gunter of Lexington, SC. Banks and Nancy Gunter married about 1816 in Lexington County. They raised eleven children to adulthood. Several of their children moved to Alabama and Georgia while a couple stayed in Lexington County. The book is available from Amazon.com – just click on the book image above. 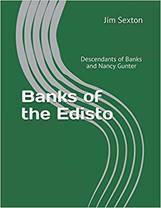 Or, search for the title on Amazon, “Banks of the Edisto: Descendants of Banks and Nancy Gunter”. Special thanks goes to L.H. Buff, Jr. of Spartanburg, SC. He is the author of the most important books on the line of Joshua Gunter that settled along the Edisto River of South Carolina. 1. Gunters Along the Edisto - the Descendants of Russel Gunter, softback, $30.00 including postage. Both publications are a must for any researcher with ties to Lexington and Orangeburg County. The Lexington Census is a monumental work, excellently researched and filled with great detail of individuals and their families from this first fully enumerated census.